The Chilton Cantelo School Fire Brigade was brought in to being in 1964. Initially an elderly land rover was purchased and a wartime trailer pump was acquired thanks to the Somerset Fire Brigade. Considerable work was done to adapt the land rover to carry a water tank, powered pump and a ladder and this was undertaken by pupils. Later the equipment and the Fire Brigade were the subject of a television programme. 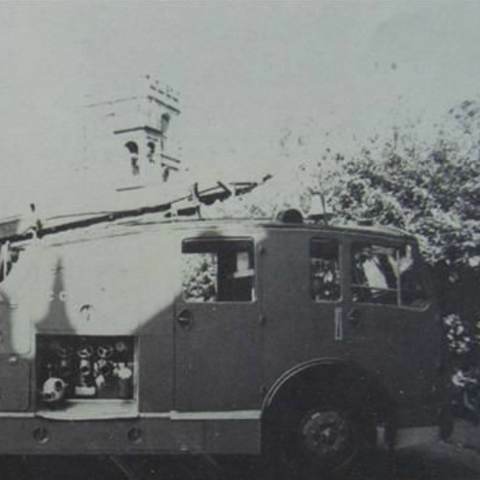 In 1967 the county fire service offered the school a Rolls Dennis F12 major appliance to which was added the necessary ancillary equipment and supply of hoses and a 60 foot wheeled escape was purchased from Hereford county. In the same year the ‘Sapeurs Pompier’ of the city of Caen (Normandy) invited the school fire brigade, complete with appliance, to spend a working week with them at their barracks. While there the school fire brigade attended fourteen operational incidents and gave demonstrations to French press and television. A purpose-built fire station was opened by the county chief fire officer in May 1972. Subsequently the school has supplied fire cover for a number of car trials, races, hill climbs, autocrosses and similar and has again been the subject of considerable television coverage. The girls were admitted as full members of the fire fighting team and accompanied them on visits to Bristol airport, R.N.A.S. Yeovilton, etc.